Report duty! Just to report to you my once-in-a-blue-moon Sunday. We brought the boys to the mall last Sunday for some fun, play and walk. We don't usually go out on weekends because hubby sometimes needs to go to the site to check on his work. So when he said we would go out that day, I jumped up and down like a jakun mad woman and felt so excited, more excited than the boys! Call me cheapo but I don't think the boys are ready for big playlands like the Mega Kids or Kidzania, so we brought them to the (economical) mini playland located just outside Aeon Big (previously known as Carrefour) at Mid Valley mall. First 20 minutes is RM5 only per kid. So why not? 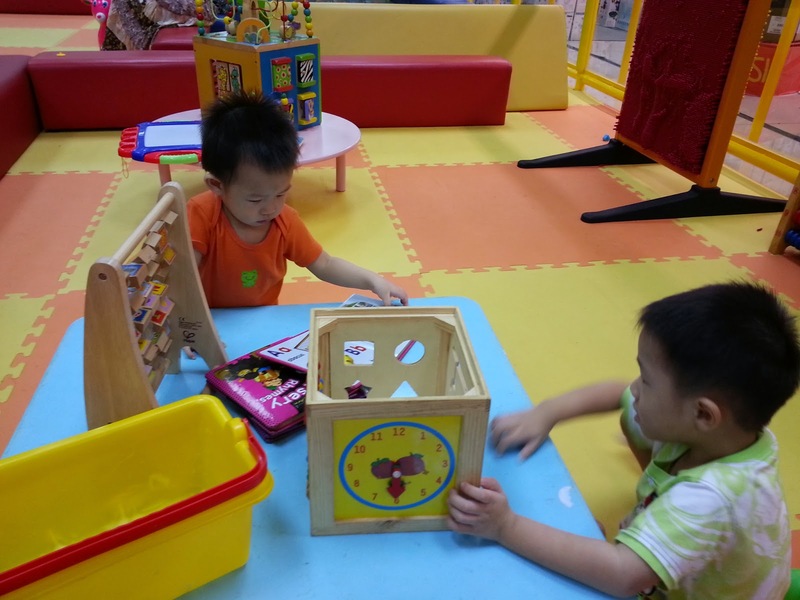 Two boys cost only RM10 for about 20-30 minutes. Let's take a selfie first, sorry for the blurry picture. The boys were shy and quiet initially, and stuck to one corner only reading books and playing masak-masak (What? Masak-masak? What the....), but thank God after a while, they warmed up and started to be more adventurous. Forgive me, but I'm a kiasu mum, if they just read books or play balls or masak-masak, then my money's not gonna worth it. I have mild OCD, but I felt ok when Kz did this. At least my money's worth it. Ok, 20 minute's up! Time to go. More than that, there's additional charges (told you I'm a cheapo mum). 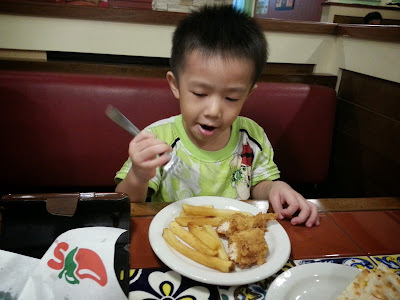 We went to Chilis for brunch - my favourite place ever since I have kids because kids eat free there (accompanied by adult meals of course). I ordered fried chicken tenders (with fries) and cheesy quesadillas for the boys. We ordered creamy chicken and mushroom soup, eggrolls for starter, beef fajitas and I had old-timer cheese burger with beef chilli and mashed potatoes. The burger is missing from the picture, but the mash is there - I pounced on the burger like a hungry lion when it arrived. Left the mall at 12.15pm. Yep, really. Reached at 10.30am and left at 12.15pm. With kids, everything has to be well planned and FAST - before they get restless and show tantrums (it happens EACH time). In this case, we've planned (in the car) to head straight to the play land first, for the kids to play (for a while) and then have a nice brunch at Chilis, then go home! You can take the boys out yourself when you have the time and the hubby's busy. They're big enough and they do look like very well-behaved kids. Can always tell them that if they do not listen to you, never again...will just leave them at home. BTW, when I tried to access your post earlier this morning, there was a malware warning. I tried a few times but it seems to be OK now. Oh ya! The third item in the Trippel Play is Chicken Crispers! Oh, I saw triple play too.. But very costly for an appetizer.. I chose the cheapest appetizer of all.. Kz ate 1 chicken tenders and all the fries.. Better than not eating at all.. I'm happy already, really.. Yes, I saw that malware thingy too.. It comes from another blogger's link, and I had to be cruel and delete that link from my blog-roll, then the malware gone already..
Of course must blog about it la.. I'm like a jakun-baru-keluar-dari-kampung, can go MV wor, sure wana blog about it, instead of cooping at home drinking my own ABC soup with noodles+egg..
Sure boh, you are very happening wor, I don't belif you will sit quietly at home those type lor..
let's see.. Saturday ah?? got a message from a friend in the morning that they were stopping by KL on the way back to Ipoh.. they take flight from SG to KL and then from KL take the KTM back to Ipoh.. so went to meet up and jalan-jalan a bit at the new shopping mall at KL Sentral lor..
wah, this Nu Sentral not bad leh, it's very big, and because of still new, a lot of lots are still empty or under renovation, only like half of the shops are opened.. and best is that it is connected to KL Sentral lor.. and can go there by LRT or Monorail, so convenient lor.. I always see this Nu Sentral from other blogs, but I've never been there before.. Seems like Nu Sentral has many restaurants leh.. Everyday can blog about different food one wor there..
and talking about our Monorail hor, last time say KL Sentral station but then never even go to KL Sentral.. need to walk so far away under the sun or rain, until dripping in sweat only sampai KL Sentral, what a joke!! and finally after more than 10 years, finally yes finally, the Monorail station is finally linked to KL Sentral via this Nu Sentral shopping mall.. at first looks like very impressive, but think about it, that is what it is supposed to be mah.. agree?? Call me jakun, I've never been to KL Sentral, I don't even know what or where is it.. I only know it's a place for people to "change" route if they are commuting via Monorail or LRT.. Like all commuters also will stop at KL Sentral one.. Like that lor.. Jakun? oh yes, I went for a movie on Saturday evening also after friends left for Ipoh.. I watched the movie Interstellar, nice woh, somemore 3 hours really worth the pay for the tickets, haha!! and you remember my credit card offers buy one get one free mah, see?? no reason I should not buy the tickets right?? haha..
You good la, can go watch movie.. Me ahh, no need say la.. Shall have to wait patiently for it to be aired in Astro Cinemax or HBO lor..
Sunday.. errr nothing special woh actually.. just went to gym, then had udon at a japanese restaurant, then hang out a bit a starbucks and then go home and prepare for the new week to come lor.. not as happening as yours hor?? I've seen friends who bring their kids out for gatherings, after an hour or so the kids start to get restless, then my friends would turn sour and say: "Sorry guys, time to leave, you guys enjoy ya!".. 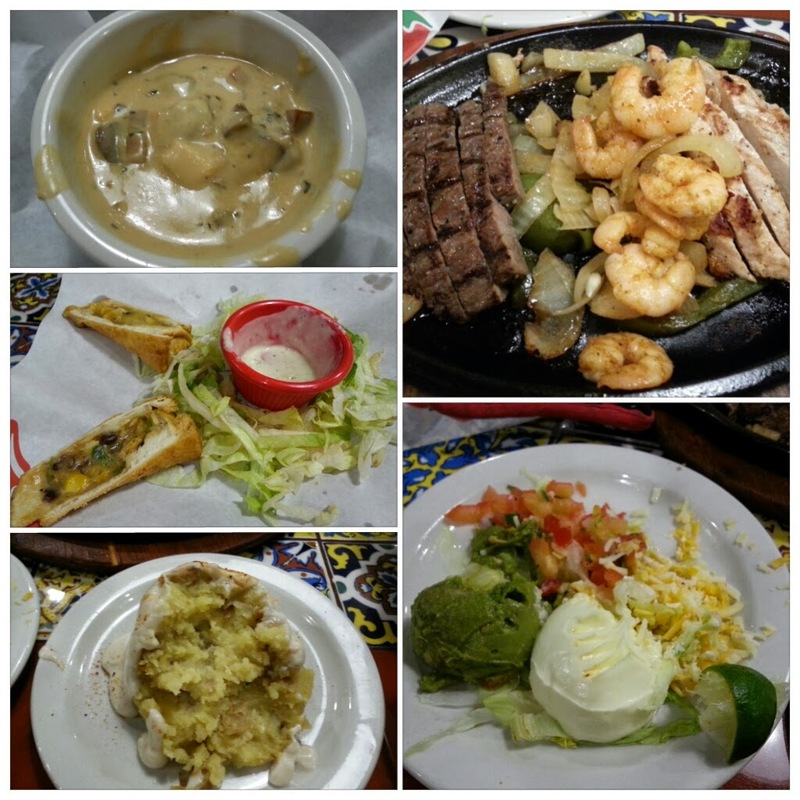 You eat very well in Chili's! Yum yum!! 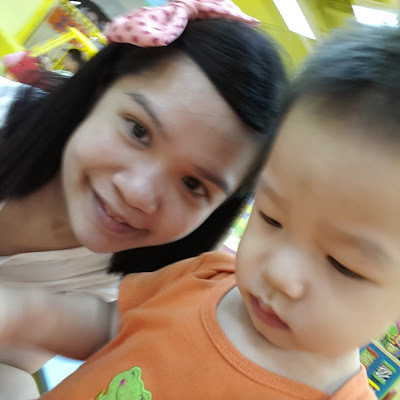 Oh yes, it's true.. My G gets restless pretty fast.. Kz gets restless too, but if you give him a Kinder Egg to hold, it will last for another 30 minutes or so..
My weekend every week is routine - stay at home, take care kids, hubby goes to work, evening to MIL's house or my mum's house.. It is nice to see your boys having so much fun last weekend. Cheapo mum??? You brought them to a playland and fed them well with good food!!! Why call yourself cheapo??? Haha, cheapo coz I don't feel like bringing them to Mega Kids.. 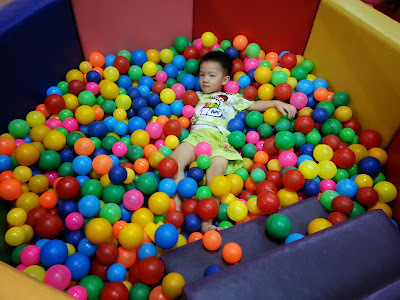 There's a Mega Kids upstairs, but it's Rm28 per kid.. Over here, it's only RM5 per 20 minutes, hehe..
Hi Louiz baby...how are you? Missing you alot. Hello baby.. I miss you lots too.. Though you don't blog often, but I see your updates in FB.. Looking good, lots of activities also wor you.. Baking, eating, going out and all.. Hoi sum mou? Cheap wor...RM5. I didnt know about that. But a bit far for me la. Ahem...if not mistaken not tesco. think it's carrefour. Edited! Thanks, Meow, you are right! Your boys are so good. I am sure no problem bringing them around. Yes. Wait till they are bigger then can bring them to expensive place like kidzania. Must learn masak-masak from the mum? Lol. Sometimes they are good, but sometimes they are not.. Depends on their mood.. Yep, when the small one is bigger, I can bring both out by myself already..
You are such a smart mother when comes to spending money for your kids! Please maintain your wise planning as many parents wasted their children's merits nowadays to splurge and spend nonsense money on the kids. They grow up so fast and no need designer clothes & toys! I have a friend who only buys original Guess Kids, Gap Kids, Osh Kosh and what nots for his children. My friend is not rich at all but very kiasu!! Nice fruitful and foodful weekend, Louiz! I see so much food and I know that Chilli serves large portions too! Oh yes! I love Chilis.. It serves large portion and kids eat free. So we could finish the kids meal too coz kids dont eat much, hehe..
Yeah, after warm up, sure naik gila until don't wana leave, hehe.. Gotta drag him out like a mad woman.. Sigh, what to do? With the two rascals, everything needs to be FAST and well-planned.. I also wana walk and stay longer, but they will start to get restless because they need to nap at 12+..
You're not el-cheapo, you're being reasonable and esp prudent. Why waste when the kids could enjoy something their age allow them to understand. Later-later lah you bring them to Megaland or even Legoland! lol. Have fun mommy! Talking about Legoland, I was surfing the website the other day, and I see thousands of ringgit for one family of four.. Sai mm sai so expensive oohh? Very good planning - very efficient too. Let the boys play and then eat and then leave. You are ok lah, RM5 for 20mins only I think is expensive already. The food looks good. 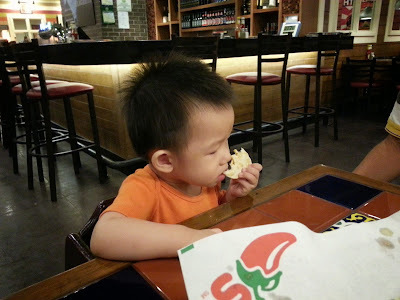 Really worth it as children eat for free. Your husband works in a developer's office ah? Have to go to site to check the work. No choice, really gotta be fast in everything. When we go for grocery shopping, we just pick and go, I have a list ready, no time for slowly walking and choosing stuffs.. Hubby is currently working on a project, so temporarily gotta check on the site during off days.. Your old blog ok jor ahh? Good to hear it wor.. No more malware attack.. Grocery shopping we usually do on Saturday.. We cant eat+play+grocery shop with them sekaligus.. Either choose eat(+play a while) or grocery shopping only..Cham hor? wow...that was a nice outing! eh...your younger one seems have a blue black on the head or was it camera trick? Bring them to some theme parks next time, I am sure they will love it. Yes! Sharp eyes! 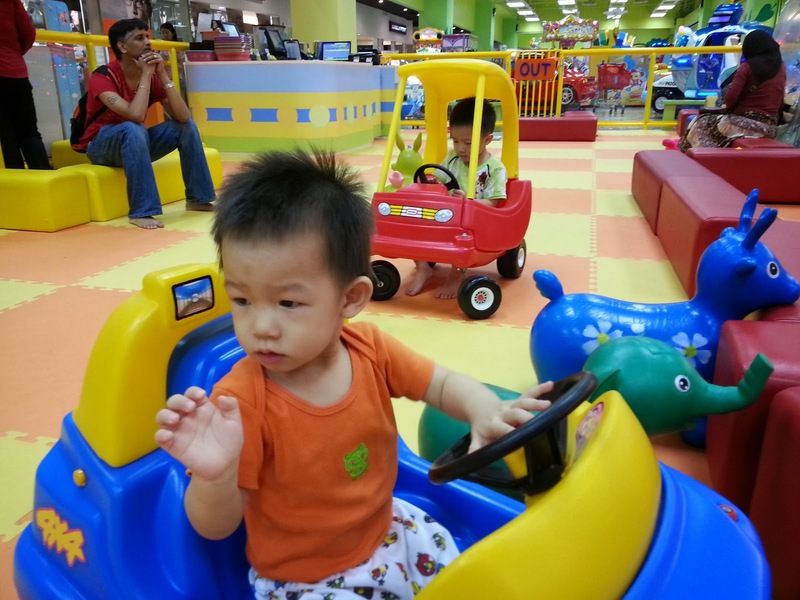 That's a blue-black on his forehead.. What else, fight with the elder brother la..
Hmm...isn't there one in IKEA too? It's free! I remember going there with the little ones and then it was closed for renovation so I'm not sure what the status is right now. Last time in Sibu, we had a HUGE Sugarbun (the fast food place) and it had a large kid's playground too - I used to love to play there, had the same mini balls "pool" and slide, which was new then. Hubby says the same thing.. IKEA one is free but that place is too far for us, we only go there if we have house stuffs to buy.. But guess we'll be making a trip there one of the weekends, coz hubby loves their meatballs, hehe..
Hmm...time to visit IKEA and see if it's open then. Yeah you are right.. Those with kids or babysit kids before will understand.. MV is famous for its crowd, need to leave the place before the crowd comes, have to keep an eye on the (running) kids somemore..